“It is like an opera,” he said, and on Wednesday evening (4th February) his words were realised somewhat with the St Peter’s Music Society production of Dido & Aeneas. St Peter’s College Chapel played host. On other days the walls might have proved imposing, but the staging was immaculate: the audience found itself ensconced in a chamber whose darkened atmosphere seemed to shrink the cavernous space five times; the players felt closer; scenes were in the main artfully lit; the costuming was simple. It breathed the intimacy and spirit of a court performance. This was all the better; Purcell’s most famous operatic work, with libretto by Nahum Tate, is short and simply structured by design. Performers were more communicative up close, church columns and stained glass became features of a Carthaginian palace, and this court setting was reflected in the performance and its pacing. This was the Director’s (Gabriella Noble) first opera, but it was well gauged. The progression of the story was clear and the chorus provided a flexible group capable of filling different roles without confusion. A simple set requires a lot of a chorus: our group were courtiers, natural phenomena and witches all. They even regrouped as sailors to perform the first Baroque sea-shanty I have ever witnessed (and likely my last) which was just convincing enough for me to suspend my disbelief. The use of dancing is particularly to be commended. Importantly, they never distracted from the focal character. 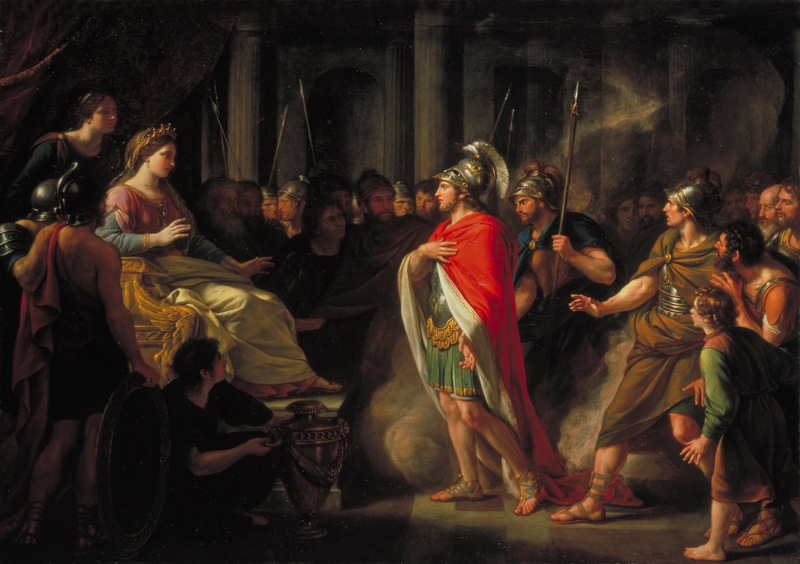 Imagery was used well and sparingly: the addition and subsequent removal of colour to Dido’s costume in line with her mood; the birds and other details of nature which featured were done with aplomb; Aeneas’ hunting prize (an animal’s head – or an angry face drawn on red card) briefly broke the spell, but otherwise the illusion carried perfectly. The nature of this opera, its small scale and natural intimacy, is also its soft under-belly: any mistakes will be loud, obnoxious and unforgiving. These were emphatic by their absence. Baroque solos, often highly ornamental in style, were never laboured nor did they detract from our understanding of their content. Rather, individual performances were captivating and made delightful listening. This is especially true of the excellent Dido (Rachel Coll) who conveyed her delicate manner and vanity with élan. Once infidelities to Virgil were put aside and this classicist got over himself, the witches and other innovations of Tate were particularly entertaining. These individual performances and others made characterisation pleasing and utterly believable. But the music made this piece. The standard both of the singers and of their accompanying orchestra was awesome. Ornaments were light, pitching was accurate, and diction was with very few exceptions outstanding. It was unpretentious and neat: the things which can so very easily put people off opera were lacking, and their absence was a welcome relief. Student opera – well, such professional student opera – comes highly recommended. Dido and Aeneas is showing at St Peter’s College Chapel until Saturday 7th February. Find out how to book tickets by following this link to their Facebook Page. Previous Post The (Virtue) Ethics of Philosophical Theology?